Device of low frequency electromagnetic correction to maintain healthy work of organism,complex detoxication and prophylaxis. 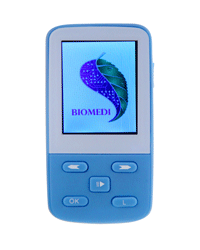 Wellness device BIOMEDIS M is used for bioresonance correction of the organism. The device harmonizes the work of organs and systems, supports immunity, helps to clean the body and eliminate toxins, struggles with stress and chronic fatigue. In BIOMEDIS M software there are more than 1000 programs for health and longevity. The additional function of the Insight device transfers the harmonizing vibrations of mantras, prayers, healing music, attitudes, intentions, affirmations directly to the person's energy-information field. Read more about the technology of spiritual development of Insight. Technology of multifrequency bioresonance correction. More than 1000 programs and complexes for recovery, prophylaxis, struggle with parasitic agents and detoxication. The ability to create and store in the memory of the device any number of complexes, if their total duration does not exceed 360 hours. Possibility of connection of hand electrodes. Technology of spiritual development of Insight. The device operates according to the method of multifrequency bioresonance correction. Bioresonance correction is an impact of low-intensity electromagnetic oscillations of a strictly defined shape and frequency that cause a resonant response in the body. The impact on the body occurs through a network of blood vessels, a network of nerve fibers and biologically active points on the surface of the skin. In the hierarchy of the human body control, the information processes are higher than biochemical processes. This makes it possible to successfully apply bioresonance electromagnetic correction to influence the human adaptation system. Any organism in a healthy physiological state has certain characteristics of its own oscillatory processes. During the physiological abnormalities, the vibrational characteristics of the organism change. With the proper selection of shape and frequency of electromagnetic influence, it is possible to enhance normal physiological fluctuations and weaken the pathological ones. The reduction of vibrational processes in the body into a physiological norm contributes to the restoration of the optimal energy information process, on which depends the healthy state of the organism. The device emits programmed electromagnetic oscillations of strictly directed action. Emitting occurs successively in frequency patches. Frequencies (of which consists a patch of frequencies) are broadcast simultaneously, ensuring the multifrequency nature of the impact. Multifrequency correction improves efficiency and reduces the time of impact. For multifrequency bioresonance correction (using software that consists of the programs included in the BIOMEDIS M software base) there are created complexes, that are imported into the device. In the menu of the device one of the complexes is selected and turned on for application. In the device there are already downloaded basic complexes for the most common problems. Technologies of spiritual development Insight. Attention! New firmware for BIOMEDIS M! Use only for series indicated below!